the USA since 1923 Morse manufactures ergonomic barrel and drum handling equipment to lift, move, and pour drums, rack drums, weigh and pour drums... drum trucks, drum dollies, drum palletizers and drum handling forklift attachments. Morse makes a full line of industrial drum handlers: drum rotators and drum rollers to mix the contents of your sealed drums. Use a Drum cone to control the flow of dry material from your drum. We also have drum pumps, drum wrenches, drum faucets and drum heaters. 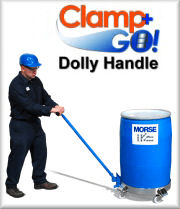 Morse manufactures the most extensive line of 55-gallon (210 liter) drum handling equipment. We also welcome requests for custom drum handling equipment. Drum Rotators / Drum Mixers - Mix ingredients inside a closed drum to eliminate spills, transfer time and clean-up. Save Time, Labor and Money! 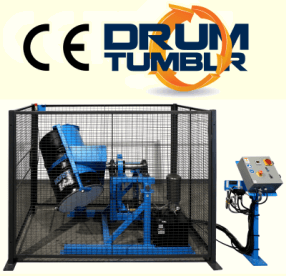 Tumble drums end-over-end to provide a thorough mix inside a sealed drum. Roll a drum on its side to mix settled contents. Transport and pour a 55-gallon (210 liter) drum with your forklift. Rotate drum from the truck operators seat. Forklift attachments to transport 1500 Lb. (680 kg) upright rimmed steel, fiber or plastic drums. Move drums on and off pallets, trucks, etc. with your forklift. Forklift attachment to move a 1000 Lb. (454 kg) upright drum. 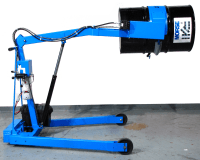 Add drum handling to your hoist or crane. Lift and pour a drum, and control drum rotation 360 degrees in either direction. Lift a drum with your hoist or crane. A below-hook drum lifter for almost any drum. Safety conscious drum handling with your hoist. 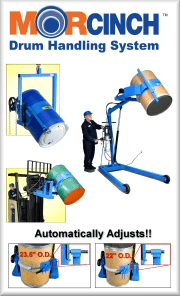 Mobile Drum Handlers - Ergonomic drum handlers to lift, move, and pour your heavy drum. Power-lift and power-tilt options increase productivity and reduce effort. Drum handling for 55-gallon (210 liter) steel drums, with options to handle plastic or fiber drums. . . and even your smaller sized drum. Vertical-Lift Drum Pourers with up to 106" (2.7 m) pouring height. Scale-Equipped Drum Pourers to weigh drum while while you pour. Hydra-Lift Drum Karriers pour 800 Lb. drum up to 8' (2.4 m) high. Stainless Steel Hydra-Lift Karriers for food and pharmaceutical applications. Heavy-Duty Hydra-Lift Karriers pour 1200 Lb. drum up to 6' (1.8 m) high. Drum Palletizers pour at up to 26" (66 cm). Mobile Drum Karriers pour at up to 17" (43 cm). Safely transport drums and move drums on and off pallets. Models for steel, plastic, or fiber drums. Model 81 Drum Spotter / Palletizer. Drum Palletizers / Movers that pour a drum at up to 26" (66 cm) high. Drum Dollies to transport and position drum. 5-Gallon Pail Dolly to move and position 5-gallon pail or can. is a safer and easier way to move many different drum dollies. Quickly disengage the Clamp+Go TM from one drum dolly , and connect to another. Economical 2 and 3 Wheel Drum Trucks. Can Tippers to hold and pour a 5-gallon pail or can. Drum Rackers - Safe, efficient drum handling to lift your drum and place into a drum rack with powered lift and tilt. 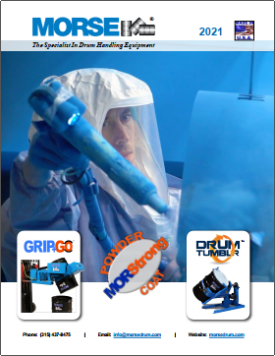 Drum Rackers eliminate hazardous bare fork drum handling. MORStak TM Drum Rackers rack a steel or plastic drum up to 8.5 feet (2.59 m) high. Omni-Lift Drum Rackers rack up to 6 feet (1.8 m) high. Handle various drums with one drum handler. Diameter Adaptors for various sizes of smaller drum. Options to Handle a Plastic Drum with the same drum handler. MORStop Tilt-Brake Option automatically holds drum tilt position even if drum contents shift from one end to the other. allow you to handle a 55-gallon plastic or steel drum, a fiber drum, or even a smaller drum with the same Morse drum handler. Drum Cones to control dispensing of dry materials. Drum Faucets to control flow of liquids. Drum Pumps to dispense liquids from an upright drum. Drum Wrenches to open and close drum bungs. Drum Heaters and Pail Heaters to warm drum contents. Fork Hook to suspend below-hook drum lifter from forklift. Drum handling equipment available in type 304 stainless steel construction. Custom capabilities enable us to design and build drum handler to fit your specific drum handling needs. PailPRO TM Pail Handlers bring ergonomics to pail handling. Use model 83 Pail Handler to lift, move and pour a 5-gallon (19 liter) pail. Morse also makes a 5-Gallon Pail Truck, Pail Dolly, Below-Hook Pail-Karrier, Below-Hook Pail Lifter, Can Tippers and Pail Heaters. Rotate 5-gallon (19 liter) pails end-over-end to mix contents right inside a sealed pail or can. Enclosures with Safety Interlock for 5-Gallon Can Tumblers. Morse is "The Specialist in Drum Handling Equipment." We manufacture 55-gallon (210 liter) drum handling solutions, including hand drum trucks, industrial drum handlers, specialized drum handling forklift attachments, and heavy-duty models for forklift mounted or below-hook drum handling with capacities up to 2500 Lb. (1136 kg). Drum handling forklift attachments to lift and rotate your drum 360 o, or to lift and transport upright drums are available. Many drum handling models are available in type 304 stainless steel. 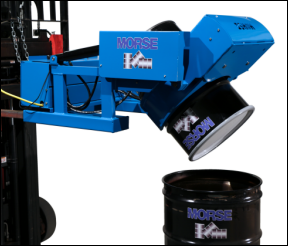 Please consult our knowledgeable staff, or your local Morse Dealer, for assistance in determining the best 55-gallon (210 liter) drum handler for your application. Requests for custom drum and barrel handling designs are welcome.